How can I repot a one stem hydrangea, and when can I cut off the flower when it dries out? How can I trim it? Is this an indoor plant? Are you keeping this as a potted shrub outdoors? Is your plant blooming now? 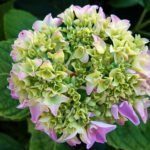 Do you know the variety of hydrangea you have? I have Anna Belle hydrangea that I cut in the fall when the blossoms feel papery to the touch. If you cut any sooner, they will not last. I am attaching several links for you to read through.